Every start of the year, we make a resolution to start de-cluttering our closets, and by the time, Chinese New Year and the annual Spring Cleaning rolls around, we’re almost ready to raise the white flag. Yes, it can be daunting, but there is relief in sight. 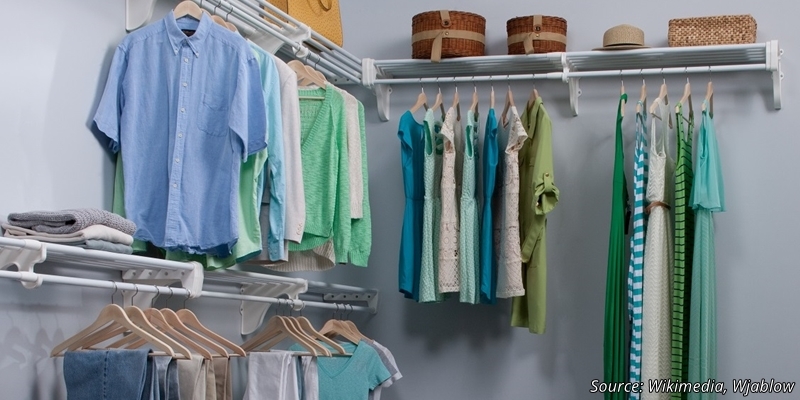 A good closet organizational system should not only keep your items neat, it should also make it easy to find what you need so that you don’t end up tearing the place apart next time you need to find a tie or a dress you wear only for special occasions. Here are some tips for when you find yourself at a cleaning impasse. A modular closet system is a great organizational tool, and can be found at popular big furniture retailers and closet solutions providers. They use different organizational tools, such as shelves, storage bins, hanging spaces and drawers, to help you keep your clothes organized and easy to find. Because it is modular, you can customize it to your exact needs, such as longer hanging spaces for dresses and suits. To get started, think about what you own, and how you would like to store it. For instance, some prefer to hang their t-shirts, rather than fold them. Then think about about how much you’re going to need for each different module. Remember, modular systems allow you to maximize vertical space, so don’t be afraid of making your closet taller if you have the ceiling height for it. Most of us fold our clothes to put them away, and end up having to play clothes-Jenga each time we want to retrieve something from the middle or the bottom of the pile. Often, we’ll see our neat piles start sliding into one another, and then we’ll end up re-folding them. A handy solution is shelf-dividers. Available online, or at closet solutions providers, shelf dividers are handy partitions that clip onto the edge of your shelves, and help you to create separate compartments for different clothes. In a pinch, bookends work as well. An over-the-door solution, such as over the door hooks, are great for accessories – scarves, caps, belts and bags. You can use them anywhere you have a door, such as the bathroom or home office. They also come in different styles so you can definitely find one that suits your decor style. Visit any condo showflat, and you’ll realize that this is a common feature that many have included. A light will help you to keep things organized and make it easier to find what you need quickly. If you have the time and money, the best solution would be to install a lighting system that automatically comes on each time you open the door. However, most big hardware stores also sell attachable, battery powered LED lights, which you can turn on with a quick tap. This article is not just about organization, but decluttering as well. Decluttering means making choices about what stays and what goes, even when its tough. You might love that pair of jeans, and they still look practically brand new, but it might have been years since you wore them because you can’t fit into them anymore. We’ve all got a couple of such pieces in the closet. Instead of hanging on to them, donate them to the thrift store so that someone else can get more use out of it. Of course, you should only donate what is still usable. Undergarments and torn items should be thrown away. Remember, it’s really inauspicious to wear torn undergarments during the Lunar New Year. To start, take your clothes out and sort them into three piles – keep, donate, and throw. It might be difficult to start, but once you get into the groove of things, it does get easier. This entry was posted in Renovation and tagged closet, modular closet system, shelf dividers to hold folded clothes. Bookmark the permalink.